Cloud computing has enabled a convenient and on-demand access to a shared pool of computing resources like networks, servers, storage, applications etc. With cloud computing technology Enterprises and SMBs can get unlimited resources at their disposal based on their dynamic requirements and also giving your applications a wider accessibility. There are several benefits associated with cloud computing. You can lower your costs, based on your changing need of hardware and software, and gain utility based pricing for the services you access or need at a certain time only. A collaborative environment is created which improves accessibility to hardware resources, and reduces the overhead cost. Cloud computing poses a lot of challenges, especially when considering migrating to the cloud. Here are a few things you need to consider when moving your system to cloud based services. 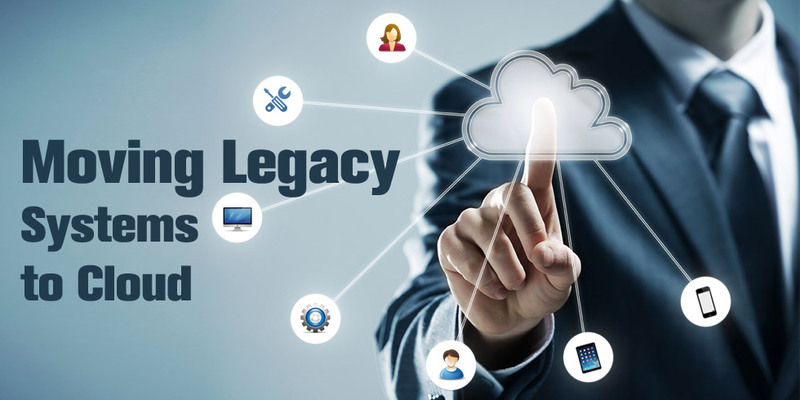 When you are moving your legacy system to cloud, security is an important consideration. You should choose vendors who offer secure and reliable cloud computing solutions. You will see that vendors have taken security pretty seriously. With their experience and quality tools, they have ensured that accessing the data is secure. Firewall and password protection is considered majorly for SaaS and IaaS services offered by these vendors. Many enterprises consider private network to double the security layer being offered. The VPN or IPSec connections offer secure data capture as well as interception from the cloud to the worker desktop. In some cases, the multiprotocol label switching network is considered to route the traffic and maintain security. Equipment failures and outages are common for a system. You need to consider cloud computing solutions that take this into account, and use redundant network switches, servers and storage facilities, which make the systems available even during failures and outages. When you are looking for cloud computing vendors, you should consider fully redundant IP connections, which offer secure access even during equipment failure or local disaster. MPLs improve reliability by adding additional security layers. It is important for you to have a SLA signed and documented before you can begin working with the vendor. This will help you define the service as well as the different aspects of service. In most cases the cloud computing providers have control on the SLA pertaining to their cloud platform. This simply means, in most cases accessibility of the cloud is a responsibility transferred to a third party service provider. While SLA is important, it needs to guarantee accessibility, and control over accessibility too. If you have access to the cloud, but it does not offer uptime when needed, it can cause heavy damage to your business. Reliability and accessibility need to be guaranteed in the SLA. Most times, SLA does not carry any terms over the operations, or loss of uptime. It is not the real tool for managing the cloud computing provider. The SLA takes into account lost service but not the business that is lost owing to downtime. Backend support and employment of best practices should also govern the SLA. When migrating to cloud, you need to consider how flexible your cloud solution is. Flexibility and response times towards change are criteria that companies ought to consider before migrating. Cloud computing as a model has matured since its inception, and so it can offer higher levels of flexibility. The same file should be accessible across the different devices. This is important considering BYOD concept has spread across the enterprises. When moving to the cloud, the management of the infrastructure is a crucial point, one that you should consider. Why are IT managers reluctant to make the move to the cloud? Moving to the cloud means committing to the new cloud infrastructure. A lot of cloud computing providers are offering fully managed cloud environment. This means you need to monitor the performance, maintain a backup and archiving routine, provide for memory and server and further the security performance of the cloud environment. Technical and backend support is essential for many companies. You should ideally check for a cloud computing provider that can provide you monitoring, maintenance and support. You should know the services you will need to pay for, and the ones that come with the cloud environment before entering into an agreement. If you commit to cloud computing fully, it may become slightly risky. Most IT managers feel that if the cloud does not work for them, it might ruin the reputation of their company. It is important to have a fully documented path for migration of applications and systems of your enterprises to the cloud. You should also define and document the procedures and policies. This will also help in escaping the cloud, in case it does not fit your need. Cloud computing is segregated into the different deployment models it offers. As part of the migration, you need to consider the pros and cons associated with each model, before deploying your enterprise on one of the models. Private Cloud: In this case, the cloud infrastructure is managed for a particular organization, either by the organization or any third party vendor. It can be set on/off site. Community Cloud: This is a shared hosting cloud infrastructure. It has been deployed for a shared community which holds mutual interests. The organization or third party vendors manage this cloud infrastructure Public Cloud: This is owned by a large industry group, which sells the cloud services. Hybrid Cloud: This is where two or more models are combined to form a third kind of model, suited to meet your cloud deployment needs. There is a standard that needs to be maintained while forming the hybrid cloud. It offers data and application portability. Semaphore Software offers cloud computing services that help you achieve your business goals. Get in touch with us via info@semaphore-software.com to know more about our services.